"This dish fills the house with an incredible aroma. The sweet and sour flavor of the spiced rhubarb sauce is truly mouth-watering. If fresh rhubarb is not available, frozen may be used. 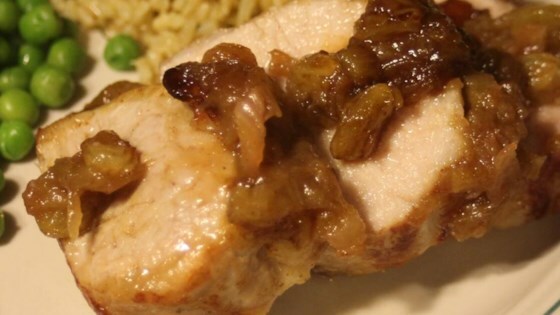 You can substitute pork roast, chicken, duck or lamb for the pork tenderloin, if you wish." To make the chutney: Combine sugar, vinegar, ginger, garlic, cumin, cinnamon, cloves and red pepper in a large saucepan. Bring to simmer over low heat, stirring occasionally, until sugar dissolves. Add rhubarb, onion and raisins. Increase heat to medium-high and cook until rhubarb is tender and mixture thickens slightly. Remove from heat and let cool completely. To cook pork: Sprinkle pork with cumin, salt and pepper. Heat oil in large, heavy skillet over high heat. Add pork and brown on all sides, about 5 minutes. Transfer pork to roasting pan. Brush with 6 tablespoons of the chutney. Place in preheated oven, brushing occasionally with 6 more tablespoons chutney. Cook until thermometer inserted into center registers 145 degrees (63 degrees C), about 25 minutes. Slice pork into medallions. Garnish with cilantro sprigs and serve with remaining chutney. My family really enjoyed this. All the different spices mixed well with the pork. I'm definitly keeping this recipe.